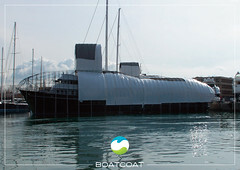 Boatcoats ability to create effective work shelters has again been exhibited in our work with assisting shipbuilders T. Nielsen’s refitting efforts at Gloucester Dock yard. The project was undertaken on a beautiful classic yacht, the Halcyon, a yacht that was built in 1929 for J I Thorneycroft of Southampton a leading industrialist. This traditional 80 foot (95ft with bowsprit) Bermudan Ketch is constructed of teak planks on oak frames with a Burma Teak interior, a full specification that melds traditional craftsmanship with modern technology. The purpose of the refit was to restore her original levels of quality and luxury; with a few modern conveniences subtly incorporated. They include modern heating; plentiful showers and toilets, up-to-date navigation and entertainment electronics, capacious fridges and freezers, and many more to ensure that guests enjoy a comprehensive suite of contemporary luxuries. 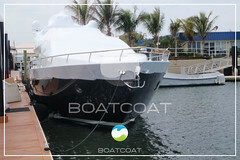 These updates aim to meet the requirements of today’s guest, which vastly differ from those of the 1920’s boaters. 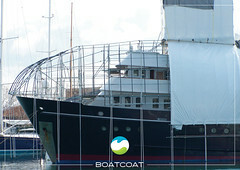 These changes have been seamlessly incorporated into the design and fabric of the yacht so that the unique and exceptional atmosphere of being on-board such a classic yacht is not affected. As the images show, a structure was created to establish an encapsulated, artificial work environment that could allow the restoration team prime access, regardless of weather condition. 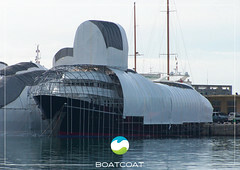 A wooden frame around the boat was erected; allowing work access underneath the shrink wrap after it had been applied. 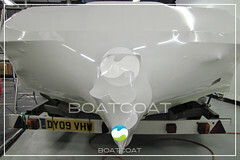 Tufcoat 190µm film was used, as is typical in many marine applications. 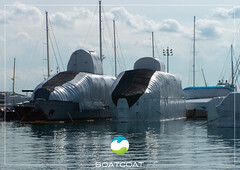 Boatcoats involvement with T. Nielsen has seen them undertake training in the use and applications of shrink wrap as they have found it hugely beneficial in their line of refurbishment work. 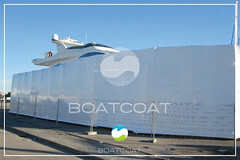 Discover more about Boatcoat shrink wrap uses for work shelters, tents and temporary buildings here. Halcyon is now operating in the waters around the UK as a luxury Charter Yacht. This fine yacht for charter combines the exhilaration of traditional sailing with 1920’s style and the luxury indulgence of a modern charter yacht. 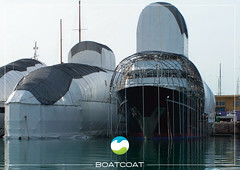 This exhibits one in a long line of problems that have been met with Boatcoats innovative solutions. 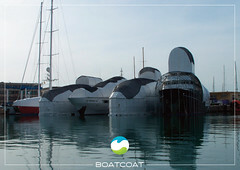 If you have a problem that we could help you with then please contact Boatcoat now on 01752 227 333 or email info@boatcoat.co.uk.